I read this article and found it very interesting, thought it might be something for you. The article is called How To Protect Yourself From Rank Spam / Negative SEO and is located at https://www.ben-johnston.co.uk/how-to-protect-yourself-from-rank-spam-negative-seo/. In my last post, I ran through a few ways that you can identify whether you’re a victim of rank spam or certain types of negative SEO/ negative PR. I also talked through a few reasons that people may be doing it. It might be worth revisiting that one before I jump in to today’s post. Don’t worry, I’ve got a coffee, I’ll wait. Up to speed? Cool. Here’s what you can do about it. One of the big problems I discussed in my last post was that a lot of the data you need to see if this is happening to you is hidden. Not provided keywords hiding your search terms, link profilers taking time to catch up and Webmaster Tools not showing you all your links makes this a lot more difficult. We can still get that information, we just need to get a little bit creative. If this is happening to you and your site and you’ve followed the steps in the previous post, you’ve probably found the kinds of keywords they’re trying to rank you for. I recommend looking through the SEMRush (aff) keyword visibility report too, just to be on the safe side and finding any others that they’re working on and you should be watching your Analytics and Webmaster Tools like a hawk. So, we’ve found the terms they’re “working” on and, hopefully, some of the links that they’re using to do this kind of rank spam, but we probably won’t have found them all. It’s time for step two. Pull all the links that AHREFS, Majestic and Webmaster Tools (don’t forget to use Bing’s too – there’s some great stuff in there) will give you, pop them into a spreadsheet and match your negative terms with anchor text (you might need to use Screaming Frog to get that from your Webmaster Tools profiles, but that’s no biggie – this is your reputation on the line, after all). This post might help with using it for this kind of process. Done? Cool. You’ve probably seen the sorts of links you’re up against now – forum profiles, blog comments, spun articles, pyramids and various other forms of automated crap. Webmaster Tools won’t show you all of these and neither will your link profile tool of choice in most cases, but if you’re seeing the effects of these links, chances are they’ll be in Google & Bing’s search results. It’s unlikely that these links will have cropped up without a bit of content around them. It’ll be horrible spintax, but there will most likely be something. If you take one and put it into these search engines, you’ll probably find a lot of your links, many of which your tools won’t report. Chances are that you’ll have identified some kind of common footprint with these links. It’s not like they’ll have been high quality, manually created ones, they’ll be things from Fiverr, Scrapebox or Xrumer – the kind of thing an angry person can create in their five minutes of rage, basically. Take your footprint search term, put it into Scrapebox and set the results to as many as Google returned. Set it to search Bing too. Now set it harvesting. Of course, if you’re going to do this, you’ll need some proxies. I recommend the Hidemyass premium proxy lists – $24 one off payment and you get a list of mostly solid proxies sent to your inbox every day, which is really handy if you’re going to be using tools like this regularly. That should find a lot of links that aren’t showing up in your Webmaster Tools profiles, Majestic and AHREFS reports. Now you’ve got something to work with. I’ve Found The Footprint, Now What? Now it’s time for some drastic link cleanup. There are literally millions of blog posts out there about how to conduct this process, but it can be boiled down to two steps: find the sites contact details and then contact them, asking them to remove the offending links. I’m not going to lie, this is going to take you a long time. There are going to be lots of sites to contact and finding their contact details might be difficult. If you’re struggling, this post might help with finding their contact details and this post offers some tips and plugins that you can use to manage these emails efficiently. If I’m honest, this is quite a likely outcome. A lot of the sites that are used for this kind of work are either networks, sites that have been built for this or they have been spammed so much that the owners have abandoned them. If that’s the case, have a look at this post of mine – it gives some tips for helping people beat comment spam, which might give you an in. If it helps, I’d appreciate a link. So What Do I Do If They Don’t Reply? You’ve got two options, really. Firstly, Google and Bing both have Link Disavow tools. I’m not a big fan of them, personally, since it’s really not overly clear what they actually do or how they work. They only time I recommend using this is when you are A) completely certain that a particular batch of links are causing your woes (which you should be if you’ve followed the previous steps) and B) you’ve exhausted all other options. If you’re going to go this route, make sure you are very careful about the links you put in there or you could mistakenly kill some of your best links. Make absolutely certain that you’re only disavowing those bad links that feature that anchor text or other negative terms or are clearly spam. Personally, I recommend the contact and clean up route. Put in the time with a few site owners that are sick of the spam and you never know, you might be able to get better links out of it in the end. Hopefully these posts have helped you either pick up the pieces if you’ve been a victim of this or have helped you assuage some fears that it could be happening to you. 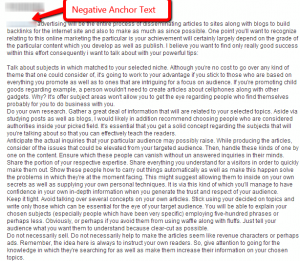 There are, of course, lots of other kinds of negative SEO and negative PR, which I might cover in the future, but this should help with rank spam. If it’s helped or if you think there are some other metrics I should cover, leave me a comment and let me know. If you’ve got a toxic link profile or someone’s doing this to you and you don’t have the time to handle the cleanup, get in touch with me – I’ll point you in the direction of people I know that can help.